Starting with the premise that "your phone is useful, but sometimes you need to put it down," Samsung this week introduced a new free app for its Galaxy Note 8 smartphone. Called Thrive, the app allows you to block all notifications (including calls, texts, and anything that's app-related) for customizable periods of time, whenever you need to just disconnect from your handset. The Thrive app features auto replies, letting those who call or text you know that you're taking a break from your phone. If you want, you can make a VIP list with people who are allowed to reach you at any time. There's also an App Control feature that aims to help you limit the time you spend on specific apps. 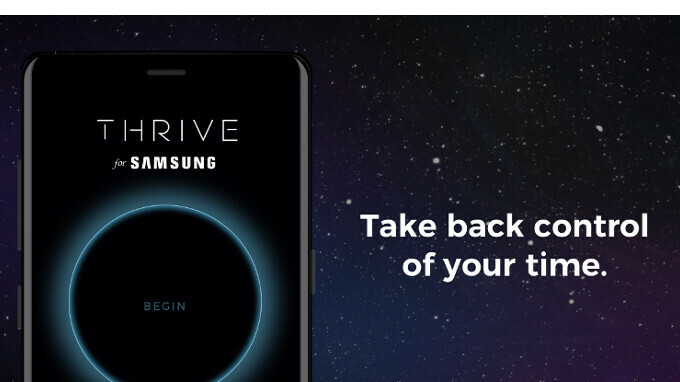 According to Samsung, Galaxy Note 8 users should have access to the Thrive app as of yesterday, January 16, via the Galaxy App store. The new application - which isn't developed by Samsung, but by Thrive Global - will be made available for more Samsung devices soon. The silent video embedded below provides a quick look at Thrive and the ways it can help you "take back control of your time". Do you think you'll want to try this new app on your Samsung Galaxy phone? I'm gonna rebel against Samsung's wishes and use my Note8 even more now. I remembered Floppy Bird, the famous game that the developer said he would stop because people were trying to play it too much. I wonder if he had just make a rule for the game to be played only for a specific amount of time maximum each day instead of stopping developing it at all. Not a chance. The Note is just too amazing and gorgeous. That's like asking a starving person, to put down a pizza...not gonna happen. Samsung doesn’t want you to burn in your screen fast. Know that I’m using note 8 FYI. But Super Amoled still has reddish tint and lot of user start to get this issue same as S8 and S8 plus I have reddish tint on my Note 8 hope Samsung shifiting to there new screen technology QLED that comes with there new Samsung TVs looks lot better than Super Amoled and OLED. Yeah agree with you about LG OLED even there OLED LG’s tv burn in easly and it’s more expensive than Samsung QLED or Sony OLED TVs.